Kalarippayat is one of the oldest living traditions of Martial training, Physical culture and self defence method in the World. The Kalarippayat is derived from two words in Malayalam, Kalari and Payatt. Kalari means the place, where any particular art form is taught. Payatt literally means practice or exercise. It is the Martial Art form of Kerala, the Southern most state of INDIA. ENS Kalari Centre was established in 1954 at Nettoor, Ernakulam Dist., Kerala, South India by E.N. 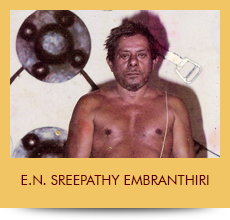 SREEPATHY EMBRNTHIRI GURUKKAL. This Kalari gives training in both Northern and the Southern systems of Kalarippayat.